made Muesli, followed by a wander around the Lakehouse Arts Centre Garden, a healthy start to the day! One of the pleasures of shooting this dish was watching it being prepared. 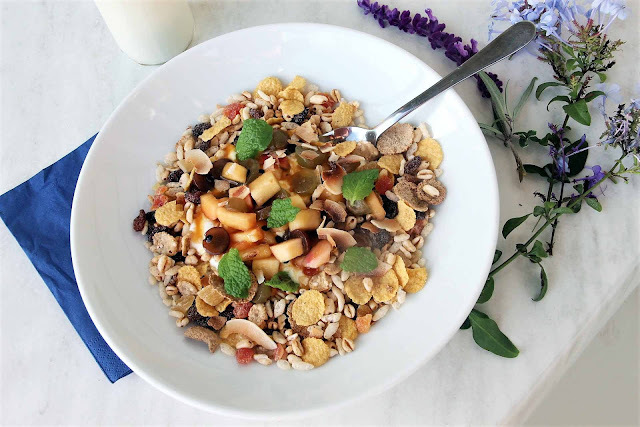 Each part of the dish ( the yoghurt, the muesli and a scoopful of diced fruit) was artfully layered and a final garnish of small herby green leaves scattered over the surface. The frustrating aspect was that that magic time first thing in the morning when the light shimmers over food was already gone.